"A human life is worth more than all the gold of the richest people in the world." 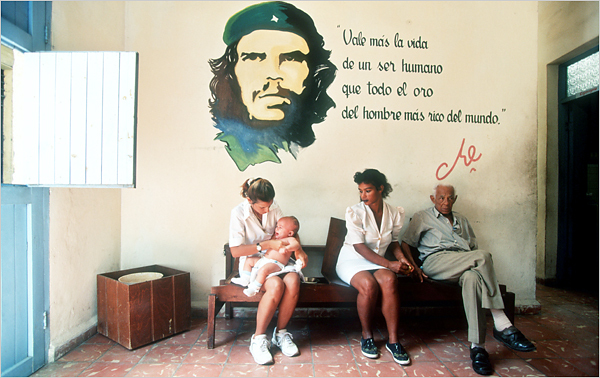 Patients waiting in a doctor's office in Cuba. Photo credit: Sven Creutzmann/Polaris. High obesity. Adults in the United States have one of the highest obesity rates in the world. Nearly a third of U.S. adults 20 years and older are obese, according to the National Center for Health Statistics. Racial disparities. Black Americans have an average life expectancy of 73.3 years, five years shorter than white Americans. Black American males have a life expectancy of 69.8 years, slightly longer than the averages for Iran and Syria and slightly shorter than in Nicaragua and Morocco. High infant mortality. A relatively high percentage of babies born in the U.S. die before their first birthday, compared with other industrialized nations. Forty countries, including Cuba, Taiwan and most of Europe, had lower infant mortality rates than the U.S. in 2004. The U.S. rate was 6.8 deaths for every 1,000 live births. It was 13.7 for Black Americans, the same as Saudi Arabia. I wonder if Michael Moore's Sicko had anything to do with the spotlight on this issue. I already told y'all that I'm moving to Paris, but this solidifies it. Check out the entire report here. Some things that surprised me, though it gets major press for strife and bombings and the like, Israel has a higher life expectancy rate than the US. Aruba, the Cayman Islands, Martinique, and the Virgin Islands all rank higher as well. What didn't surprise me as much...virtually all countries in Western Europe, with the exception of Portugal, rank at or higher than the US. And then, of course, we have Sub-Saharan Africa, which is in the bottom of the bottom. I did not know that life expectancy in Mozambique was 32 years and 51 in Nigeria. Cape Verde, Mauritius, Reunion, Seychelles and Saint Helena seem to be doing the best.